I am up relatively early at 7:30 am and Kelly at 8:00 am as we have to drive back to Hobart and then out to Eaglehawk Neck to Fortescue Bay. We eat breakfast and pack up and leave at 9:10 am. We catch the 10:00 am ferry back across to Kettering. 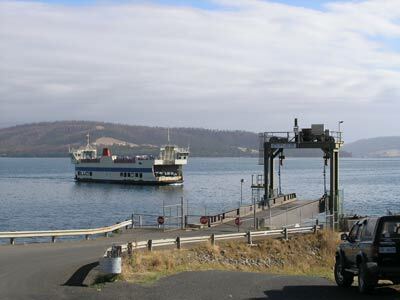 We leave the ferry at 10:25 am and head north towards Hobart. 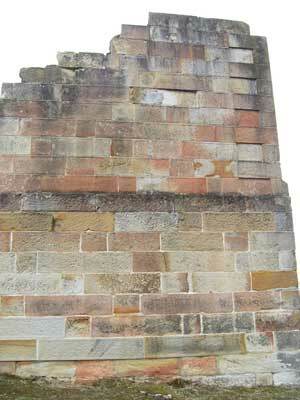 Again, we do not stop at Hobart and travel out over the Tasman Bridge to Bellerive. 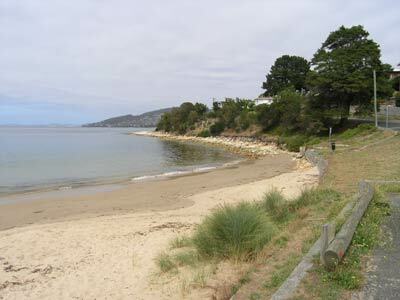 I want to do a dive at Bellerive Beach which is right next to Bellerive Oval, the main cricket ground for Tasmania. The reason I want to do this dive is that it is one of the only places in Australia that you are almost guaranteed to see handfish. 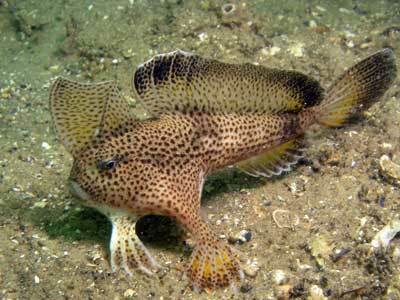 These strange looking fish sort of walk around on their "hands" (modified fins) and use a lure dangling from above their head to attract and catch smaller fish. We find our way to the cricket ground and at 11:15 am park at the western end of the beach which is on the River Derwent straight opposite the centre of Hobart. Kelly has decided that she is not going to dive as she is all blocked up with sinus (and this is something that prevents diving). It is only shallow so I will go by myself. I enter the water and see an eagle ray straight off and within four minutes I find the first of three handfish. 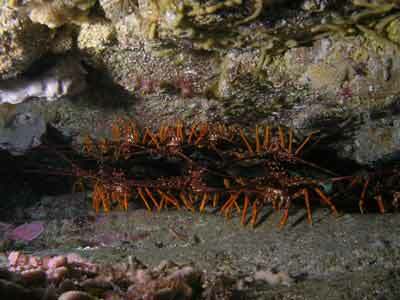 Click here to go to the diving article for a detailed description of the dive and photographs. When I get out of the water after a 45 minute dive, Kelly has the hot shower ready for me (what a thoughtful wife) and she goes off to get us some fish and chips from the shop next to the beach. I wash my gear and we then eat lunch. Excellent fish and chips by the way. At 1:30 pm we leave and go to the nearby Rosny Park Shopping Centre as we need to get some things. We are back on our way at 1:45 pm and head out past the airport on the A3. A funny thing happened this morning on the way into Hobart, we noticed one petrol station was selling Unleaded fuel for $1.279 per litre while all the rest were $1.479. Unfortunately it was too dangerous to go to that station once I noticed it and very difficult to get back to it as we were on a one way street. Anyway, as we approach Sorrell, I see another station selling petrol for this very low price. I fill up with $98 worth, saving about $14. Very strange! We continue onto Sorrell and I look for a grog shop to get some beer. However, I find nothing of interest in the bottleshop. I get some money out of the bank and we head off towards Eaglehawk Neck. We arrive at the dive shop at 3:00 pm as we want to see what is happening tomorrow about our diving. We find out our first dive is at 8:30 am and that two dives are planned. We also find out that the dive on Saturday is at 7:00 am so we make arrangements to camp tomorrow night at the dive shop, hooking up to their power etc (they are on a small property just out of the town proper). We leave our dive gear at the shop to dry as we do not have the facilities to do it. We need to do some washing as it is almost two weeks since we washed the sheets and we are also low on a lot of other clothes. We find out that there is a laundromat at Port Arthur township. We drive there and see a large sign but we cannot find it. It takes a while to figure out that the laundromat is hidden on the side of a real estate agent and has no signs at all. Very confusing! We pull the sheets off the ShippShape and Kelly puts on as two loads as this is the maximum we have change for (taking into account drying). While she watches the washing, I go looking for timber as we need some supplies. I drive up the main road a bit (and see another echidna) and find a fallen tree that is the perfect size to cut. When I return the washing is complete and we put it in three dryers. We go to the English style hotel just down the road. This is called the Fox and Hounds Inn. We have a beer and I also purchase a carton of beer. When we get back, the clothes are almost dry. Just shows what a good dryer will do, 20 minutes and dry versus 40 minutes and still damp like at Queenstown. 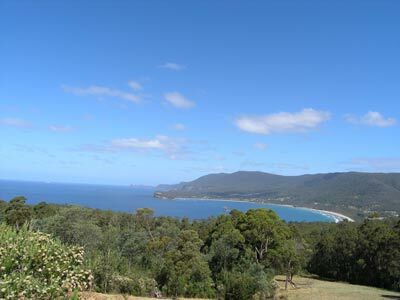 We drive the 15 kilometres to Fortescue Bay, getting there at 5:30 pm. This is a very nice camp site. We book in and get allocated a site. This costs $12 a night and is located straight above the boat ramp. The camp site is nice, with waterviews and close to the toilet block. We set up camp and crack open a beer. There are a lot of fishers here, with plenty of boats. One group offers us some flathead but Kelly declines (I do not eat fish). Before dinner we go for a walk to the boat ramp and then the beach. The views over the bay are great. We cook dinner and plan to go to bed early as we have to be up and gone by 7:30 am. Soon after dark, another bunch of fishers comes back in their boats and pull them out. They are camped between us and the boat ramp and they have obviously been drinking all day as a couple can hardly walk. It appears they only own one CD, as they play this over and over and over again. Not only this, it is country and western music. It is crap. We hear the same songs at least five times over the next three hours. They are also so stupid they do not realise that their CD play has a volume control that lets you select less than full! This goes on till midnight when they turn the CD off. However, they keep on talking and arguing till 1:15 am. Our neighbours tell us the same thing happened last night and despite complaining, the rangers did nothing. Why are so many fishers idiots who have no consideration of others? Today we are doing a couple of dives. One good thing about diving in Tasmania is that the dives start late. Whereas in NSW you normally have to be at the dive shop at 7:30 am or 8:00 am at the latest, here it starts at 8:30 am. As we are a fair distance from Eaglehawk Neck, we have to leave by 7:30 am. We are up at 7:00 am and quickly pack the rest of the gear and tent away and leave. I stop at the park office to complain about the fishers but it is not open. A great spot spoiled by the poor behaviour of a few. We get to the dive shop and gear up. The boat is moored in the bay next to Doo Town and we are transported by their LandCruiser Troop Carrier to the wharf. We load the gear on the boat and are soon on our way to Cathedral Caves. 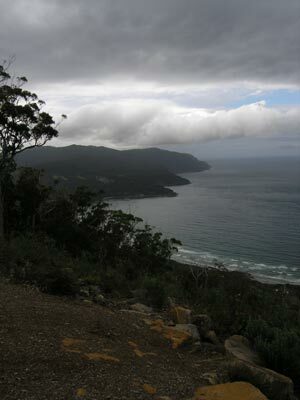 This is located to the south of Waterfall Bay. One thing about this location is that every time we have been here the water has been as flat as a tack. It is a great dive, one of the best I have ever done. Click here to read more about the dive. We head back to the wharf after the dive as there are other divers to go out while we have a break. We head back to the dive shop and have a cuppa and some cake while we swap over tanks. 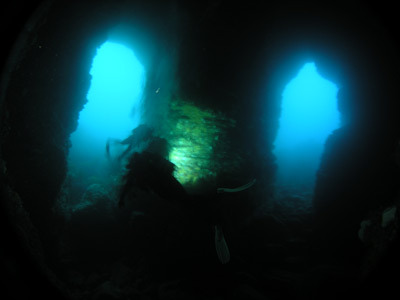 Unlike NSW, most dives in Tasmania appear to be single dives. Even if you are doing a couple of dives in the one day, you go out, do your first dive, come back to the shop, have a break, then go out again for the second dive. If you only have a short distance to run out, this is very good and also more economical. Nearly all the dive sites in Tasmania are close to the boat ramp/wharf so this is how they operate. At about 12:30 pm we are taken back to the wharf. For the second dive we head out to Boulder Point which is north of the wharf. For a description, click here. After the dive we go back to the dive shop and wash our gear. As I mentioned yesterday, we are staying here tonight. After we wash our gear, we drive to Cashs Lookout via Pirates and Plateau Roads. 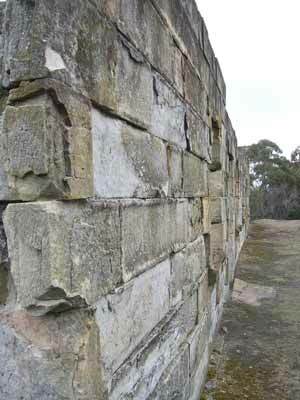 This is about 440 metres high and has great views over Eaglehawk Neck. 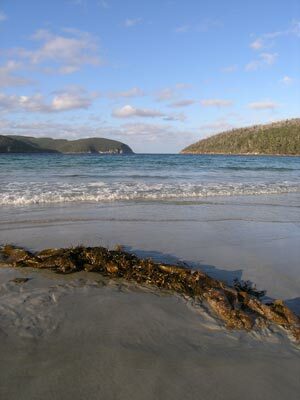 It is only 15 minutes each way from the Arthur Highway and worth visiting. We head back to the Lufra Hotel where we had a great dinner last time here. We find it crowded. There have been some units built adjacent to the hotel and a lot of the workers appear to be having a Friday night drink. It is happy hour and they have free hot finger food and cheap beers. This is excellent (crumbed prawns, calamari, chips etc) and we have a few beers and lots of finger food before driving back to the dive shop. We set up our tent and have another beer on the grassed area. However, it soon starts raining so we went into the common area of the divers' lodge. We only cook some two minute noodles as we are pretty full from the pub's finger food. We talk to the other people here. Some are divers and others are just backpackers. We go to bed at 9:30 pm. It is very windy overnight and it rains almost the whole night. It is not looking good for our dive tomorrow which is supposed to be to the wreck of the SS Nord. Today we were supposed to dive the wreck of the SS Nord. This is a deep wreck, just over 40 metres down. We have come prepared and have already set up our tanks the night before at the dive shop. However, the wind has blown at least at 30 knots from the south-west all night. As the wreck site is near Tasman Island at the southern end of the Eaglehawk Neck Peninsula, the last four kilometres or so will be open to the full extent of the wind. We stay in bed. I am really disappointed that we will not be able to dive it. We finally get up and speak to the dive shop operators. They are gearing up to go out with their planned second dive but this is full of other people. There will be a dive after this but one of the owners actually talks us out of diving by telling us that the other divers are all new and that they are all hopeless. 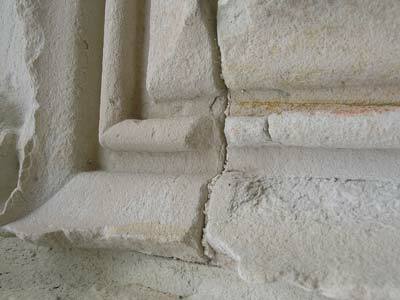 We know that we will end up at a site that will be more suited to their experience rather than one of the best. We decide not to dive. As it turns out, I am glad we made this decision as tomorrow we hear on the radio and read in the newspaper that a female Irish women had an incident underwater and was flown to Royal Hobart Hospital in a critical condition. I really did not want to have to contend with that sort of problem. 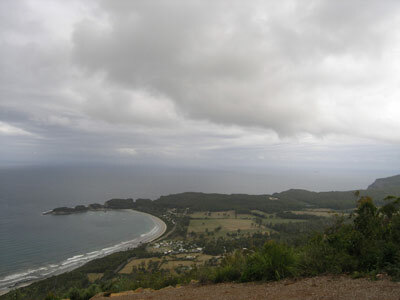 We head off at 10:30 am and drive to the Waterfall Bay Lookout. This has great views over the bay towards where we dived yesterday morning. On the way out of the state forest we collect some firewood for tonight. 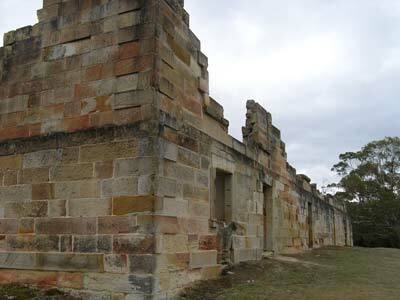 We decide that we will drive to Lime Bay via a circuitous route of Port Arthur (we are not going to the historic site as we went there in 2005 - excellent by the way and well worth seeing) and Nubeena. We divert off to White Beach which is a nice little village and then attempt to go via Roaring Beach to Saltwater River. However, we encounter a locked gate and have to back track to Nubeena. We decide to go to the pub here and find it packed, full of people (mostly men) betting on horse races. It is still very windy and cool, 15ºC, but feels more like 10ºC. 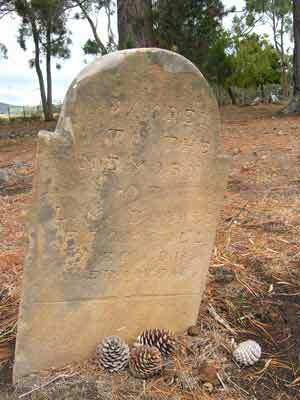 After the beer we drive to Premaydena and looked at the old cemetery. There are many people buried here that came from Coll, the same place in Scotland that my father's family originally came from. It appears they left Scotland about the same time. Next to the cemetery would be a nice place to camp if the wind is from the south. We drive to Coal Mines Historic Site via Sloping Mines, another small seaside village, arriving there at 1:30 pm. We have lunch in the first car park. After lunch we walk to the main section of the mines. 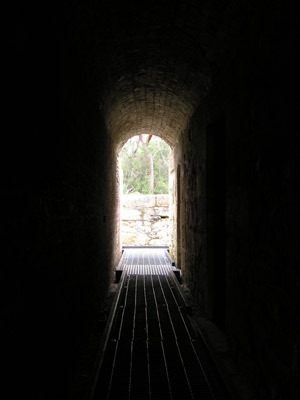 The mines were built and staffed by convicts. It is quite an interesting place, over 600 men were here. There are the remains of cells, chapel/school, isolation cells (look the same as the normal ones - very small with no light at all), barracks, superintendent's home. It starts raining here and we cut short our walk. We go back to the car and move to the next car park. Here there is a short walk that goes to the main mine shaft and signal station (used to send flag signals to Port Arthur) and more. All these sites as well as a ventilation shaft are connected and in fine weather, it would make an interesting few hours to explore them all. 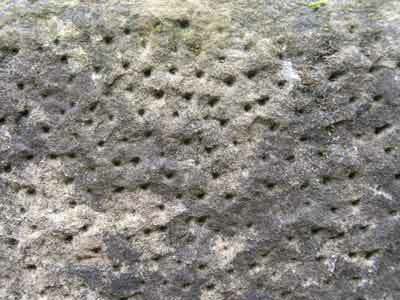 As it is, we have seen some fascinating things. 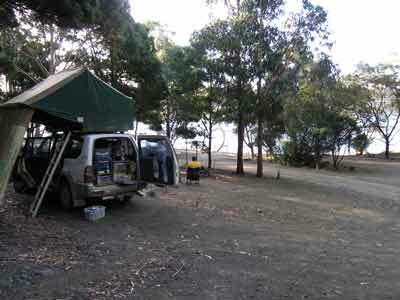 We arrive at Lime Bay Camping Area at 3:00 pm and pick out a spot. There are only a couple of other cars here at the time. It costs $12 for the night. 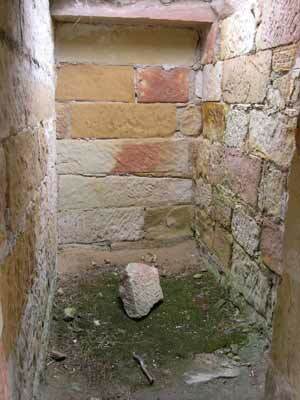 There is a nice toilet block. As it is still raining on and off, we put up an awning out the back. During the afternoon some others arrive, including a couple of German girls in a very battered Ford Falcon. They are sleeping in the back it appears. We read for most of the afternoon, before going to the beach to have a look. It is quite protected and nice. On the way back we see yet another echidna. I go and tell the girls and take them to see it. One was working on a station in Queensland so she has seen one but the other had not. They take lots of photos of it. At 5:00 pm we have drinks and invite over a bloke from the Riverina in NSW who has set up his camper trailer near us. He has just retired as a rice farmer and is single. He purchased a new diesel Toyota LandCruiser 200 series a few weeks before the trip. Tonight we are having another baked dinner. I have started the fire early and I cook roast silverside with potatoes, carrots and sweet potato. As usual, it is great. When we go to bed it is cold, 10ºC and windy. There are a lot of big gusts of wind as well.